$50.00 a month for 7 months (an additional bonus project, making it 14 projects total) or prepay for all classes at once for a savings of $150.00. Call or stop by the shop to receive a prepaid registration discount. Order of projects will be emailed to customers at time of signup. New for 2019! 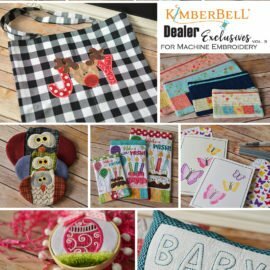 Dealer Exclusives Volume 3 includes 13 designs to introduce new techniques, teach embroidery skills. An additional project is being included for a total of 14 design projects. Requirements: Embroidery Machine in good working order with a hoop size of at least 9" x 5"